This past Memorial Day weekend friends invited us over for a great cook-out. And the reason it's so much fun going over to their place is that the appetizers rock, almost to the point that I'm too full for the burgers!! But never too full for the cookies! Two recipes will be shared this week from that wonderful meal: Joey's Corn Dip and Pearce's Lemon Sugar Cookies with Buttercream Frosting--awesome, super simple and perfect for college living! As the weather continues to warm up and picnics are on the rise, you will want some quick fix appetizers or desserts to take along! 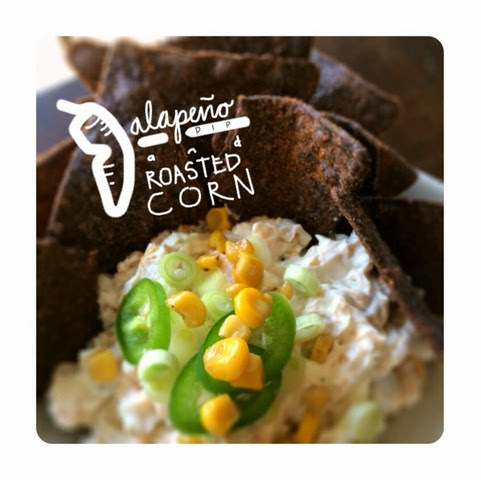 I modified the dip just a tad, by adding 'more' heat and roasting the corn, but my, my, my....is this stuff good! If you have grilled corn or have leftover corn cobs--use the leftovers, but if you are in a pinch, use the corn kernels in a can, i.e. Green Giant has very little additives, sugar or salt. If you are low on time, skip the roasting! 2. Prep, drain, dice and grate your ingredients as recommended above. 3. Melt your butter and olive oil over MEDIUM-HIGH heat. 4. Add your corn and 1/2 of the diced jalapeños. 6. Sear the corn slowly until golden brown, but not burnt! Add a little lime juice. 7. While the corn roasts, combine the cream cheese, sour cream, and mayo until smooth. 8. Add sharp cheddar to the cream cheese mixture. Add a little more if you need to or add pepper jack if you want more heat. 9. Add the remaining jalapeño and green onions. Adjust taste with salt and pepper. 10. Once the corn is golden brown and slightly cooled, combine it all with the cheese mixture. 11. Have the chips ready!